I remember the best one she ever made. I had fallen in love with Greek Mythology and wanted to dress up as Athena. I wore draped white and purple cloth for my robe, and I’m sure I had a spear of some sort. But the pièce de résistance was the helmet my mom made for me. She made the most magnificent Greek war helmet out of cardboard and aluminum foil, and used red, shiny wrapping paper over foam rubber for the crest. It was the one year I won a costume prize at the school carnival. So I try to remember my little girl self at Halloween when I start getting a little too scrooge-like and think about turning off all the lights and bypassing the candy aisles this time of year. Halloween was a time of simple delights, and I hope it’s that way for many of the children who will celebrate it tomorrow. There are plenty of reasons that celebrating Halloween may not be for you. I don’t remember when my church shifted away from having a Halloween party to having a harvest festival. Now, I don’t think there’s even a fall festival there. I have good friends who don’t celebrate Halloween with their own young children for religious reasons, and I can respect that. I have read recent posts about why some of my blogging peers refuse to celebrate it, and I respect their decision. There’s a growing argument against Halloween’s popular chocolate candy bars, because of the child labor that is rife in the chocolate industry. This issue is the most difficult for me to even write about, because I simply don’t know enough about it and feel ill-equipped to argue about it. And maybe that makes me a Halloween ostrich, sticking my head in the sand so I can hand out relatively inexpensive candy bars the kids prefer instead of smarties or other non-chocolate candies. I also hate the scary movies and the evil or gory images that abound this time of year (that’s really a year-round loathing for me). But I don’t think I’m going to stop celebrating the good and joyful part of Halloween any time soon. I simply haven’t come across a compelling enough argument against celebrating it. And so as long as the children don’t get too grabby when we hold out the bowl for them to choose a few favorites, and as long as most of the trick-or-treaters wear costumes, I’m willing to play along and help make All Hallow’s Eve fun for them all. What about you? Do you celebrate Halloween? Why or why not? Do you have a favorite Halloween memory or costume or tradition with your family and friends? I’d love to hear from you on this eve of Halloween. 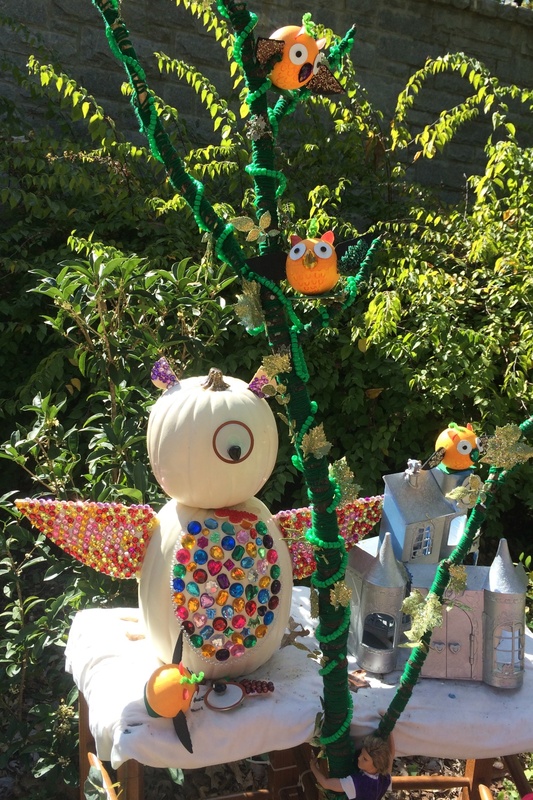 This entry was posted in flourishing tree and tagged candy, chocolate, costumes, family, Halloween, Halloween scrooge, jack-o-lanterns, trick-or-treaters by hopesquires. Bookmark the permalink. I enjoy aspects of Halloween. The dressing up part is lots of fun, though for two of my boys, it was a late in the game event, rummaging through the dress up box to figure out this years’ costume. The girls plan more but one of them is self conscious and gets cold feet as it gets closer…hoping the ninja shows tonight. My mom always popped lots and lots of popcorn and gave it out – kids really liked it. In today’s more safety conscious world, most people probably wouldn’t let their kids eat it. One of our older neighbors makes gingerbread man cookies and that is a big hit with many. We have the opposite problem that you have – we live in a funky connector street and don’t get many trick or treaters. I always wish we had more. We have adapted our celebration this year due to some dietary changes. Hoping it is a fun night. You have great memories of Halloween and your mom sounds like an amazing costume designer! = ) I love the own pumpkins in the photo. That gives me an idea for tomorrow night!